The anatomy of the human eye shows that it is anything but “intelligently designed.” It is built upside down and backwards, with photons of light having to travel through the cornea, lens, aqueous fluid, blood vessels, ganglion cells, amacrine cells, horizontal cells, and biploar cells, before reaching the light-sensitive rods and cones that will transform the signal into neural impulses. To understand what he is saying, look at the illustration above. When light hits the surface of the eye’s retina, it has to travel through layers of cells that essentially connect the retina to the rest of the nervous system. Only then can it reach the light-sensitive cells, called rods and cones, and be converted into a signal that can be sent to the brain. This, of course, seems backwards to most evolutionists. According to them, if the retina were designed intelligently, the rods and cones would be at the retinal surface so they are the first thing the light hits. That way, the connecting neurons could be placed behind the rods and cones so they don’t interfere with the light in any way. The retina is revealed as an optimal structure designed for improving the sharpness of images. The authors of the analysis showed that the position of the rods and cones in the retina combined with the way the Müller cells guide the light to them make them much less sensitive to light that is scattered within the eye itself. This, in essence, reduces the “noise” that the rods and cones would get from errant photons, making the overall image sharper and clearer. I blogged about this previously, pointing out that it is precisely what creationists predicted and quite opposite what evolutionists maintained. I am bringing it up now because further research has confirmed the creationist prediction in an even more stunning way! The same scientists who published the 2010 study teamed up with two other scientists and continued to analyze the exquisite design of the retina. To understand the results of their new study, you first have to understand the difference between rods and cones. Both types of cells detect light, but the rods simply detect the presence or absence of light. The cones, on the other hand, detect color. Because they detect color, however, the cones aren’t as sensitive to light. In poorly-lit situations, then, your sense of sight depends strongly on the rods, and you don’t get a good sense of color. In well-lit conditions, the cones become more important, giving you excellent color vision as well. Generally, speaking, of course, there is more light available in the day than there is at night. Thus, we can say that in general, your night vision is heavily dependent on your rods, while your day vision is heavily dependent on your cones. This means there is a trade-off when it comes day and night vision. For ideal daytime vision, all the light that hits your eyes should be directed to your cones. Of course, if that happened, you would have poor night vision. For ideal night vision, all the light that hits your eyes should be directed to your rods. Of course, if that happened, you would not have any color vision. In other words, the Müller cells direct the light to where it needs to go so that humans (and guinea pigs and probably all vertebrates) have the best daytime vision possible without significantly impeding their night vision. Now please understand that none of this would be possible if the rods and cones were placed on the retinal surface, which is what evolutionists have consistently argued would be the best design. Had the Creator designed our eyes the way evolutionists thought they should be designed, not only would our vision be more blurry (as shown in reference 3), but we would also have poorer night vision, poorer day vision, or perhaps both! The next time you hear someone pontificating about “bad designs” in nature, remember the design of the retina. Evolutionists were convinced it was a bad design, but modern science shows us that it is, in fact, an exquisite design. The more we study nature, the more it testifies to its Creator. Labeling can be very frustrating, and usually anyone subscribing to a group, or category of beliefs does not in fact believe EVERY aspect of said group or category. Hi Kendall. I’m not sure that there is an exact definition of an evolutionist, just as there isn’t an exact definition of a creationist. However, “evolutionist” generally refers to someone who thinks evolution is the principle means by which all the species we see today formed. Whether or not a theistic evolutionist is a creationist depends, I think, on the level of involvement he or she attributes to God. Dr. Francis Collins and Dr. Karl Giberson, for example, attribute no action to God in the process of evolution. Instead, God simply set up the world so that evolution would inevitably produce people. I would call them evolutionists, because they basically agree with what an atheistic evolutionist believes when it comes to the details of evolution. Their only source of disagreement with atheistic evolutionists is how the universe was set up to begin with. Someone like Dr. Alvin Plantinga, on the other hand, believes that evolution occurred, but it was guided by God. That implies a lot more involvement on God’s part, and as a result, I would not consider him to be an evolutionist. I would call him an evolutionary creationist. Of course, these are just my definitions, but the phrase “evolutionary creationist” is used by others. I do agree that labeling can be very frustrating. However, at some point, you have to do such labeling. After all, it’s not just atheistic evolutionists who use the “bad design” argument. Even theistic evolutionists use that argument. Without labeling, the writing gets incredibly cumbersome. It’s funny that I use my eyes every day, but hardly ever think about how well-suited they are to their job. God really thought of everything! Regarding the evolution-inspired idea that the light-sensitive portions of the eye should be at the front, that just seems silly to me. Surely the lens at least has to be in front of the light-sensitive parts? I can’t imagine a camera that had the lens in the back! Keith, I don’t think anyone has suggested that the rods and cones should go in front of the lens. The evolution-inspired suggestion was that in the retina itself, the rods and cones should come before the connecting neurons. 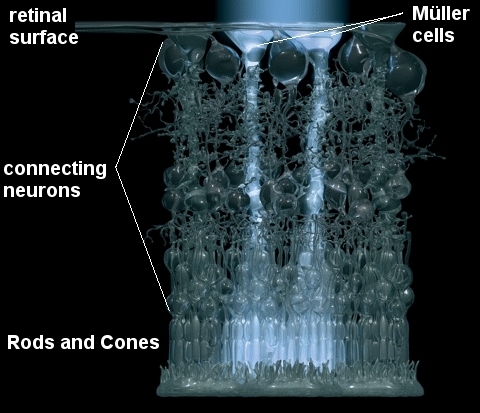 We now know that the actual design, with the rods and cones behind the connecting neurons and Müller cells guiding the light to its destination, is a significantly superior design. But wasn’t Dr. Shermer complaining about the position of the lens (among other things) in that quote? I don’t think so, Keith. I think he was just giving the entire path the photons have to travel to emphasize that there is a lot of stuff to get through. Some of that stuff is necessary (like the lens and the cornea), but other stuff is supposedly in the way (like blood vessels, ganglion cells, amacrine cells, horizontal cells, and biploar cells). If that’s what he means, then his statement is definitely poorly worded. It sounds like he’s lumping ALL this stuff together as being “in the way”, in front of the rods and cones. The article has several more details as well. Ironically, evolutionists are blind to the obvious design of the eye. Creationists have know about these design features for a very long time….why?….because we look for them. I think I’m a little confused: How necessary is it to the evolutionary paradigm that structures in organisms be inefficient? I understand how evolutionary thinking would lead scientists to expect to find “poorly designed” structures, but that seems less like a direct prediction of evolution and more like an extra conjecture. Do evolutionists need to argue that evolution isn’t optimized to produce the best biological structures because evolution is in a sense random, and hence we have to see inefficient structures around? And how does that balance with the idea that the “fit” organisms survive? Further, judging biological structures inefficient seems incredibly subjective: How is the statement that the eye would be more efficient if the rods and cones were closer to the retinal surface at all testable? That scientists would confidently make such statements seems problematic – and not scientific at all. At the same time, I’m not sure I understand the creationist position, either: Is it a necessary prediction of intelligent design that every biological structure we see has to be, um, intelligently designed? I can understand that this leads to the assumption that the biological structures we do find are indeed well-designed and contain nothing superfluous – which actually seems testable – but who’s to say some other structure may or may not be more efficient than the ones we see? Not that I think we can teach God science; rather, I guess I’m saying that declaring some structure is the “most efficient” it could be seems not entirely scientific. I think I just confused myself further; does any of this make sense? Jake, I don’t think inefficient organisms (or inefficient structures within organisms) are necessary to the evolutionary paradigm. However, as you note, it is easy to see how evolutionary thinking would lead to such an idea – random processes rarely offer the best solution to a problem. However, as Dr. Hunter points out in many of his articles (see here, here, and here, for example), evolutionists use supposedly bad designs in nature as an argument for evolution because they have such a hard time supporting their view with positive evidence. Thus, they try to show that evolution must be true, because some parts of nature are designed in a way that a human designer wouldn’t consider. Since “bad design” destroys the creationist view (in their minds), the only possibility left is evolution. When we use the phrase that “fit” organisms survive, you have to understand that fitness is not the goal of evolution. Indeed, evolution has no goals. In the minds of most evolutionists, mutations are completely random. If the mutation happens to make an organism more “fit” for its environment, it will be more likely to survive. If it makes the organism less “fit,” the organism will be more likely to die. If it doesn’t affect “fitness,” the organism is neither more likely nor less likely to survive. Without any end goal in mind, evolution can’t design organisms to be “fit” for their environment. It can only stumble upon things that will enhance fitness. That won’t normally produce organisms that are the most “fit.” Instead, it will only produce organisms that are as “fit” as possible, given all the random processes that came before. I am not sure that judging structures to be inefficient is subjective. However, it is fraught with difficulties, since our knowledge is limited. Take the eye, for example. Because we didn’t know the actual function of Müller cells, it only made sense to many scientists that putting the rods and cones at the surface of the retina would make vision more efficient. Once they learned the actual function of Müller cells, scientists were able to build models of the retina and show how the design is optimized to reduce scattered light and to make the best possible tradeoff between day and night vision. So I think this very blog post answers your question, “How is the statement that the eye would be more efficient if the rods and cones were closer to the retinal surface at all testable?” It’s testable by building models and seeing what the consequences of each design would be. Of course, to build a model, one has to understand the system, and that’s what kept scientists from testing the “bad design” argument of the eye for so long. Until we understood what Müller cells did, there was no way to build a model of the retina. From a creationist point of view, I do think it is a necessary prediction that structures in the natural world be well-designed. After all, creationists believe in an all-powerful Creator. Thus, one would expect His original creations to be very well-designed. There are, however, two important caveats. First, the creationist maintains that structures are well-designed for the world as a whole. That might not be the best thing for the individual organism. I can imagine situations in which an inefficient design in an organism might be better for the ecosystem as a whole. Second, we aren’t looking at the original creation. We are looking at a creation that has been affected by the Fall. Thus, there might be some well-designed structures that have degraded over the years. Of course, I would expect to be able to find evidence for each of those caveats. Thus, while I wouldn’t expect every structure to exhibit exquisite design, I would expect each structure to be optimally designed for the organism or optimally designed for the organism’s ecosystem or show signs of degradation. Now, from an intelligent design perspective, one would not necessarily expect these things. Intelligent design says nothing about the designer. It could be that the designer was a drunk alien. In that case, one would expect some examples of really bad design in nature. Intelligent design simply tries to show that there are ways to distinguish the result of design from the result of naturalistic processes. Whether the design is good or bad is irrelevant. These considerations weren’t the point of this post, however. The fact is that many evolutionists have trotted out the vertebrate retina as evidence for evolution, because it was so “poorly designed” that it couldn’t be the result of creation. Creationists didn’t have a solid answer as to why the retina is designed the way it is, but they maintained that it was well-designed – we just didn’t know why. In this case, then, the evolutionary view was demonstrated to be false, and the creationist view was demonstrated to be correct. Thanks for answering, Dr. Wile. I think what bothers me about claims that various structures are or aren’t well-designed is that we can’t really say one way or another until we understand the structure well enough (which, as you said, is why the retina claim went untested until now). Also, it seems that, when evidence is lacking, it’s easier to say something is poorly designed than to say it’s well-designed. At least, that’s how I think about physics: I approach a problem and expect the simple answer – or whatever currently makes sense to me – to work (especially if I like the simple answer for some reason). Unless I actually work through the problem and find it doesn’t work, I’m going to continue to assume my current understanding is correct. So for this kind of thing, I’d say the honest thing to do is to say something like, “This looks poorly designed, but until we know more about it we can’t be sure.” But perhaps that’s asking too much of scientists; we love to speculate. Jake, I agree that we tend to speculate and judge quickly. If it’s not good in our eyes, it must not be good, right? I wonder why your network blocks my site. Do they really think it’s that bad for students to read a different point of view?